Basses: Jonathan Wolf, Ray Livnat, Yarden Gruman, Amit Fortus, Erez Tovi, Guy Moshkovitz, Yanai Avnet. Tenors: Elad Peretz, Baruch (Bam) Gruman, Ben Saada, Ray Livnat, Chen Sharon, Dima Fridrich, Yan Ben Yosef, Adar Elmackias. Altos: Rakefet Ann Ben Shabetai, Shani Gruman, Leah Marcu, Tali Shahar, Hadar Shemesh, Neta Ben Harush, Yael Cohen, Yael Abady. Sopranos: Rinat Gruman, Atalya Emily Shuorki, Zohar Ben Haim, Nitsan Cohen, Shaked Baydatch, Almog Dror, Carmel Cohen, Yael Abady, Hadar Shemesh. For a while now I have been wanting to highlight quality progressive metal and progressive rock from the great country and state of Israel. There are certainly many bands and talent in Israel that get overlooked on the global progressive rock/metal communities. That hopefully is all about to change. Just as I believe that Israel deserves to exist as a state and nation I also believe its artists and bands from the progressive rock and metal communities deserve to be spotlighted with articles and the upcoming series of album reviews I have coming to Power of Prog.This series is also in celebration of Israel’s Independence in 1948. This series will go all the way through 2018 to mark the 70th Anniversay of Israel becoming a nation. My personal views on Israel or my album review observations do not reflect the other members and staff of Power of Prog. In a part of the world that that is often rocked with such great turbulent turmoil there often goes a great musical community that can be easily overlooked. Surrounded by enemies from all sides and those that seek to destroy her is the nation of Israel. Centuries old conflicts on the world stage sometimes gather more attention than its very vibrant and thriving art and musical community. Among the vibrant thriving symphonic progressive metal community in Israel is none other than independent upstart’s Scardust with their debut album titled Sands Of Time. When Noa Gruman – Lead Vocals told me she was sending a physical CD along with a digital press kit I was truly grateful. This has allowed me to follow the lyrical content, instrumental content and the artwork that seems to get pushed aside, however is just as significant as to what you hear on the album. All these factors work wonderfully hand in hand together. Scardust are just not another Epica, After Forever or even a Delain clone from Israel. Scardust as a band have far more to offer and their own unique sound that to draw a comparison to those bands would be very unfair. I will venture to say Scardust have developed their own sound that many newer bands going forward will be taking something away from them. First of all Noa Gruman – Vocals has a death growl, a semi operatic voice and even a deep powerful power metal vocal about here and that becomes obvious throughout the entire Sands Of Time album. The Sands Of Time album is a partial concept album with the opening multi tracked 27+ minute epic Sands Of Time that encompasses the first five tracks of the Sands Of Time album. In terms of any comparison, I would compare Sands Of Time the 27+minute epic to something like Dream Theater did with A Mind Beside Itself – 1. Erotmania, 2. Voices & 3. The Silent Man from 1994’s Awake album. A epic that was multi track to suffice a label yet without abandoning their fan base. Sands Of Time is that epic for Scardust. This starts out with a isolated violin and stringed section before a very explosive orchestral instrumental atmosphere in harmony with a equally explosive choir in perfect time and harmony to the instrumental melody. The instrumental contains both metal and symphonic elements within it. It only contains four verses/stanza’s however they prepare the listener a brief over view of what is to come within the Sands Of Time story. This seamlessly transitions smoothly from the first act Overture. There is a melody of piano with heavy rhythm sections happening both in the guitar and bass/drum. Soon the beautiful feminine vocal narrative comes into being. The lyrical narrative can be seen from the perspective that a person can not shake the images of war and that those images plague them night and day, awake or in a their sleep. The instrumental does a beautiful job adding to this emotion. Soon it goes from a clean female vocal narrative to a mean and angry melodic death metal narrative done from the angrier perspective provided by the dual vocal personality of Noa Gruman herself. Once again this seamlessly and smoothly transitions off of Act-II Eyes Of Agony. The choir continues to bridge the gaps and tie the over all Sands Of Time epic from the very beginning of this track. This is also a pivotal point where the band start to really tighten up their unique cohesive sound and present more as a musical brand. Accompanying the choir is a deep bass/drum rhythm section along with some reprisal portions that maintain the epic atmosphere. There is a very Chris Squire-esque Yes type of bass to keyboard section within this before it gets back into more familiar and modern progressive symphonic metal territory much like a cross between Epica and Dream Theater. Lyrically the track remains rather dark and anger driven properly and on point with the bands main objective of the Sands Of Time epic. This part of the epic ends with a very symphonic induced section that sounds like a mini orchestra with a beautiful soprano conveying the lyrical and melodic narrative. This continues the epic through a smooth and seamless transition off of Act-III Dials . It follows with a beautiful guitar and keyboard atmosphere before the female narrative vocally comes in with some isolation and then joined in melody with the instrumental portion of the track. It also seems the band are really tightening up everything into a core unit of sound. There is this perfect balance between progressive metal and symphonic metal really happening here in this portion of Sands Of Time. Some of the vocal narrative is almost cabaret like at times both in the singular narrative or the plural narrative in the choir. This is also the perfect transitional portion of Sands of Time to begin to close it on the final portion Act-V Sands Of Time. This seamlessly transitions perfectly off of Hourglass. It begins with a beautiful piano with the beautiful female vocal. This starts as a beautiful ballad like atmosphere. The choir comes in and out lending further depth and layers into this classically endowed piece. On the lyrical side the song and story begins to come to a close thus completing the entire Sands Of Time epic. Arrowhead starts the last half of the album. It is ironic that the band incorporate the sound of crickets and give the track the personality of a morning style atmosphere. It is symbolic to the new beginning of the other half of the album. Noa Grunman’s isolated vocal picks the listener up where it left them on the Sands Of Time epic and once again hooks them into another story line lyrically. Instrumentally this track is full of thunderous rhythmic blast beats and a very percussive bass to match the equally tuned down rhythmic stringed sections on the guitars. The other half of this song is very choir and vocal harmony driven. Out Of Strong Came Sweetness opens up with a sound much in the tradition of Savatage’s Hall Of The Mountain King instrumentally. The levels off into a more orchestral and symphonic track utilizing various choirs and various off vocal harmonies. The instrumental really works very well both melodically and harmoniously especially when the grunts work in tandem with the choral portions. The choirs are a huge attraction to this song. Queen Of Insanity starts off with a absolute shred fest that morphs into a blistering and thunderous rhythmic frenzy. The guitar riffs remind me very much of Jeff Loomis Nevermore era, meets Mike Romeo SymphonyX. The growls and grunts done by Noa Gruman remind me of classic Mark Jansen Epica ex-After Forever. The female vocals of Noa Gruman ascend to a entirely different level and we discover her immense vocal depth and ability. 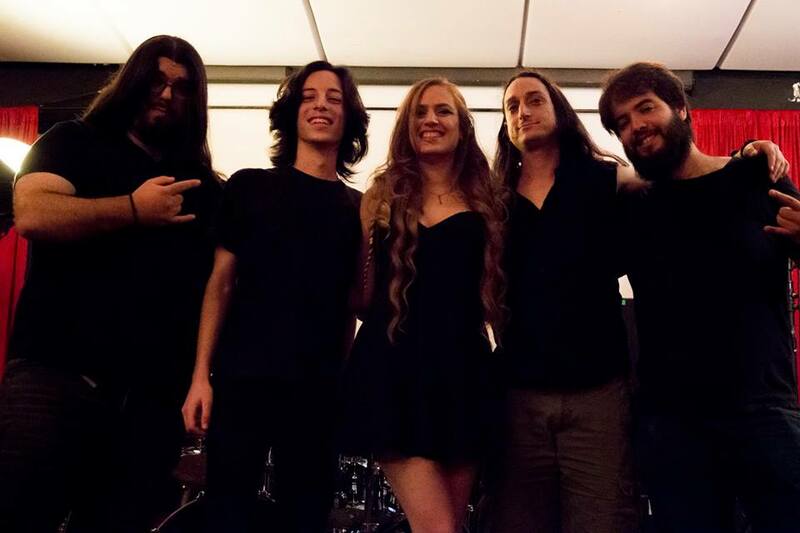 She is a fine breed of both power metal and progressive metal with symphonic tendencies. Blades opens up with a beautiful ballad like atmosphere with a beautiful duet between Noa Gruman and Jake E Amaranthe. This is all highlighted by the beautiful progressive/symphonic instrumental that is often at time atmospheric in nature with the soaring guitar solo’s and orchestral portions. This track reminds me a lot of Kamelot’s The Haunting. The guitars are very well balanced between progressive passages and symphonic passages. Gift Divine opens up with a beautiful atmospheric piano that is soon met by the beautiful atmospheric female vocal narrative. The heavy orchestral portions of both keyboard and bass and a entirely different dimension than what the rest of the album has been. The band really know how to layer various instruments in on perfect time. The layers are very progressive in attitude yet symphonic in nature. The band has a very cunning ability to bring the listener in that is more of a warm invitation without overwhelming them. This song is a excellent example to all the band are capable of doing. Israel is a country that is very under rated and often overlooked for their progressive rock, progressive metal contributions to the world. In a land that has given the world Orphaned Land, Reign Of The Architect, Quietus, Yossi Sassi Band, Soul Enema, Distorted Harmony, etc … Scardust are certainly a band that can continue to establish Israel as a progressive metal powerhouse on a global scale. 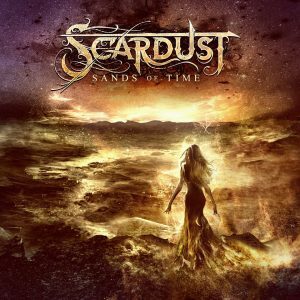 Due its unique sound and consistent intensity, I am giving Scardust’s Sands Of Time a 5/5.